Just to make things interesting, a wild storm brewed it’s way into southern Alberta. We raced against it as we drove out again to Siksika, hoping that high winds, lightning and rain would skirt around us long enough to get the tipi set up. Miracle of miracles, the thundercloud gods answered our prayers and we were able to execute everything that we were unable to accomplish the day before. Ivan was there, busily attending to many of the tipis being setup around the circle in preparation for this weekend’s pow wow. Thanks to the Breaker family, whose tipi you see on the right, for all their help each and every year with poles, many hands and always a happy comment and open arms. Extra thanks to Audrey for helping us find a makeshift belt for Gracie, whose pants elastic gave way and left her grasping at her trunks, less they drop to the prairie grass and any BOY saw her. I can’t wait to review the film for the setup and share it with you here and on the CAMP project. It’s really something to see how quickly such a strong structure can be put up and what a wonderful nomadic design was created by the Blackfeet and other indigenous cultures. 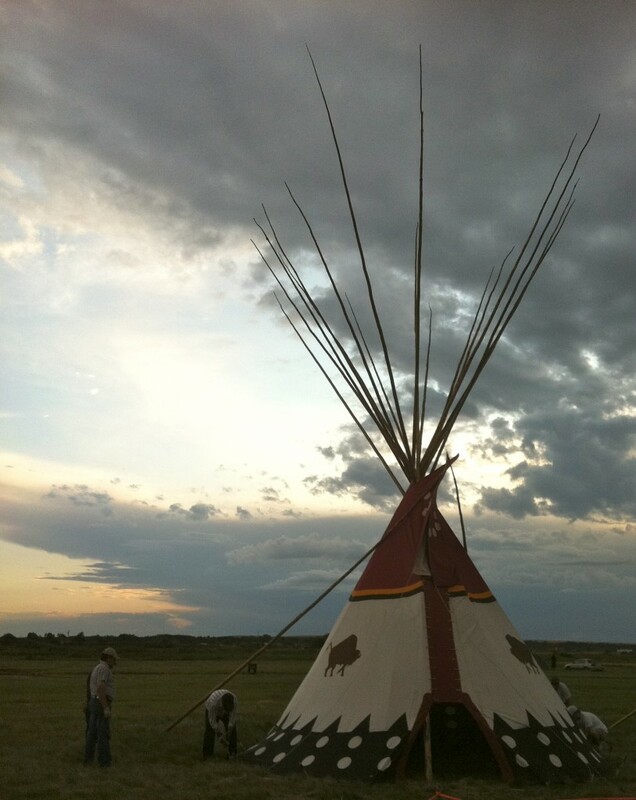 You just haven’t lived until you’ve spent a night in a tipi camp. It’s one of this families’ favourite things to do. 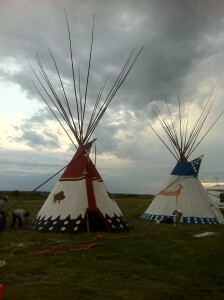 This weekend, we’ll head back there for the pow wow and share the happenings on this blog. Here is the beginning of the story with some incredible photos….just in case you missed it!